posted by Howard B. Owens in weather, corfu. Ritchie Kirkum submitted this photo, which he shot (he received as a SMS message) in East Pembroke. 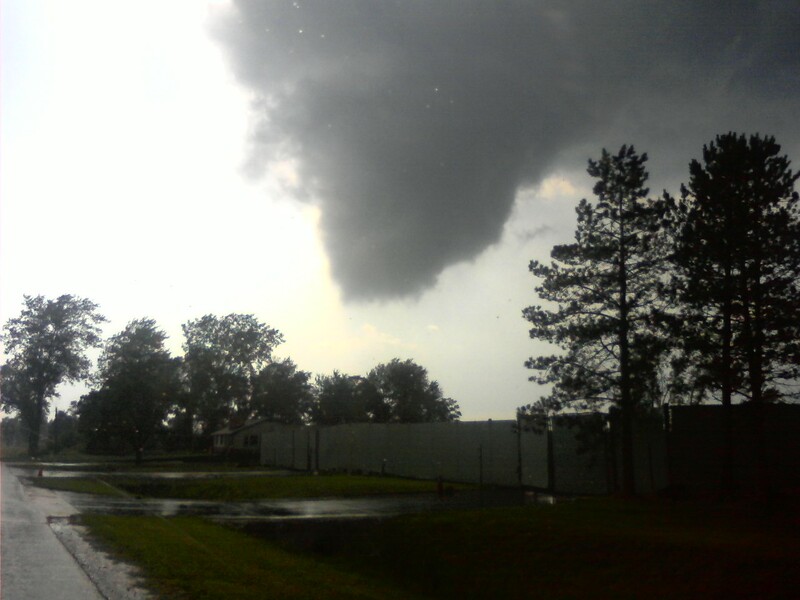 A funnel cloud, or tornado touched down in Corfu just before 5 p.m. knocking down about 15 power polls and numerous trees. There is some building damage, but no serious damage has been reported so far. 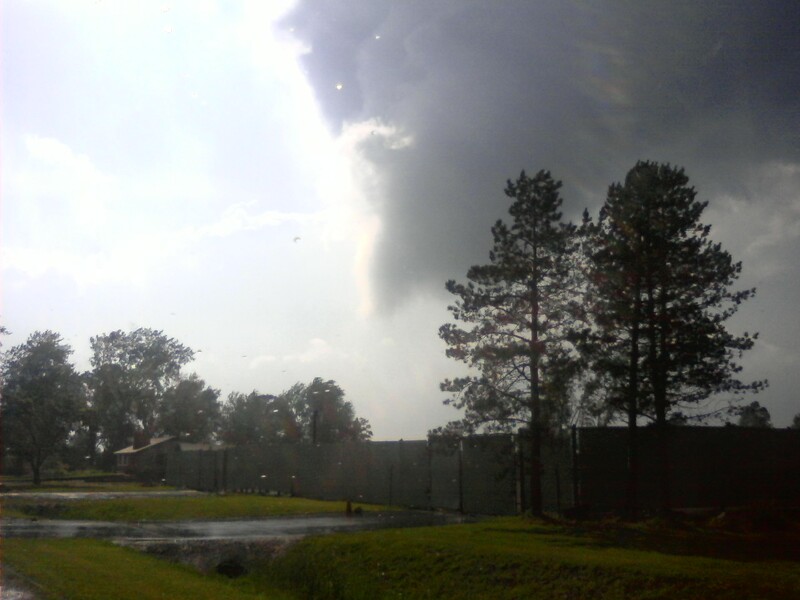 The tornado was tracked by the National Weather Service heading toward Oakfield and was expected to reach there at 5:20 p.m. 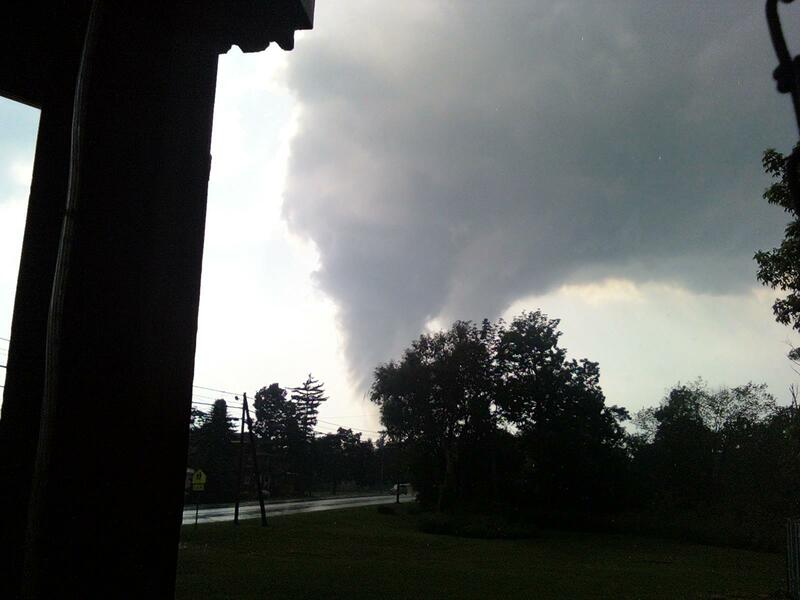 The tornado has apparently not touched down elsewhere in Genesee County by 5:35 p.m. and was moving into Orleans County (if it still exists). There has been the smell of natural gas in the village and work crews are being dispatched to shut down utilities, with an ETA of 25 to 60 minutes. Portions of routes 33 and 77 have been shut down. UPDATE 5:44 p.m.: Tornado warning has been cancelled. UPDATE: Audio interview with the Corfu Fire Chief. 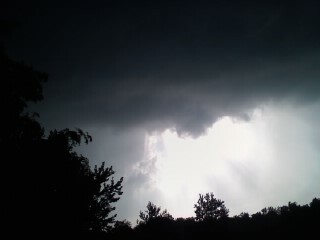 Heather Wooton submitted this photo from her backyard in Holley. UPDATE: 10:13 p.m. Finally back from the scene, had some dinner ... my battery died out in Corfu, so I'll be doing some more updates now. A reader submitted this photo. I've seen it on the cellphones of multiple people. 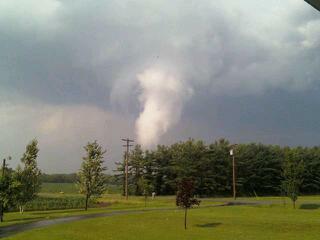 It may be the most widely distributed cellphone picture of the twister. TV news crews at the scene were complaining that they couldn't use it because nobody knows who took it. We here at The Batavian are quite confident it hasn't been doctored in PhotoShop. That just seems highly unlikely, so no concern about sharing it with you. 5:40pm Unsure if this info is correct!!! I have been told Pizza Pantry has been leveled. One of those interviews I just posted was with Louie Reeb, who was working inside Pizza Pantry when it hit. Pizza Pantry has now power, but is otherwise fine. The photo I posted I recieved it via txt message, I did not take it. lol I don't want to steal credit just wanted to share the photo! Does anyone know if 33 is still closed through Corfu? My friend just bought a house right there and we are trying to find out if there was any damage to it. Saturday is the only day I work 8am - 4pm at Darien Lake. Any other day, I would've been there until at least 9pm during the whole thing. I kid you not, everything is going to be broken when I go in tomorrow. In other news, I was sleeping through this whole thing. I got about four hours of sleep before I went in, so I've been dead to the world for the last five hours. Btw Brian, were you there yesterday afternoon? I was, Chris. I'm feeling the water park right now. Posted by Chris Olin on July 25, 2009 - 9:54pm Saturday is the only day I work 8am - 4pm at Darien Lake. Any other day, I would've been there until at least 9pm during the whole thing. I kid you not, everything is going to be broken when I go in tomorrow. Chris, do you know Bob-Cat? If so, tell him I said, "hi". I live by Terry Hills and it was sunny here the whole time. Only rained hard for a little bit. I saw you there. I called your name as you were getting on the Viper, but you didn't turn so I figured I was seeing someone that looked like you. That's funny. Call it louder or go with Hilly instead of Brian. We might go again later today after the storm so maybe I'll see you there. What do you do there. The job title is "Games Tech", but I fix everything that breaks, regardless if it's a game or not. The only days I'm not working there are Wednesday's and Thursday's. You'll usually find me over by the shooting range near the Viper entrance. My "office" is over there.